Mark Richt knew who would start under center for Miami’s Atlantic Coast Conference opener against North Carolina. But the Hurricanes’ faithful found out when N’Kosi Perry ran onto the field for Miami’s first drive, which was met with a roar of cheers. 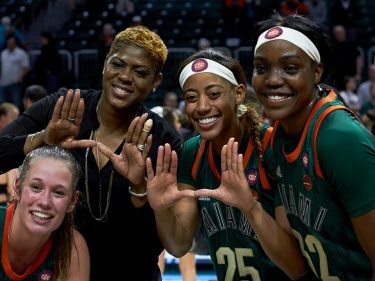 However, it was the Hurricanes’ defense — which entered the game ranked second nationally in total defense — that stole the show. Miami’s defensive unit tied a program record with three touchdowns and forced six turnovers to lead the No. 16-ranked Hurricanes to a 47-10 victory over the Tar Heels at Hard Rock Stadium Saturday, Sept. 29. The last time Miami scored three defensive touchdowns was Sept. 23, 2000 at West Virginia. Drive after drive, Diaz’s defense swarmed North Carolina’s offense, finishing with three interceptions, three fumble recoveries and 14 tackles for loss. The Hurricanes (4-1, 1-0 ACC) held the Tar Heels (1-3, 1-1 ACC) scoreless across the final three quarters. North Carolina coach Larry Fedora tried to shuffle Nathan Elliot and Chazz Surratt at quarterback, but Miami contained the Tar Heels’ offense. Jonathan Garvin donned the “Sebastian the Ibis” Turnover Chain twice with a pair of fumble recoveries and scored once on a 9-yard, scoop-and-score touchdown. In the second quarter, fellow junior defensive lineman Joe Jackson picked off Surratt and returned it 42 yards to the house. Yet, the Hurricanes’ defense wasn’t done. Jhavonte Dean intercepted Surratt in the closing minute of the first half for Miami’s third takeaway to set up a 28-yard field goal from Bubba Baxa to put Miami up 33-10 heading into the locker room. Romeo Finley joined the party with an 83-yard, pick-six touchdown to open up the fourth quarter, before Bradley Jennings Jr. closed out the defensive showcase with a fumble recovery late in the contest. Miami scored 21 points off of those six takeaways to lessen the load in Perry’s first career start. The redshirt freshman completed his first five passes before finishing 8-of-12 for 125 yards with one touchdown and one interception. Redshirt senior Malik Rosier, who had started 17 consecutive games, relayed signals on the sidelines rather than directing the Hurricanes on the field. 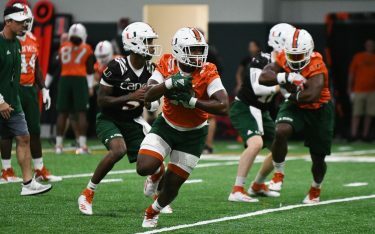 Perry received help from the Hurricanes’ two-headed rushing attack of Travis Homer and DeeJay Dallas. Dallas notched a career-high 114 rushing yards and one touchdown, while Homer tacked on 88 yards on the ground. Miami will return to action against rival Florida State 3:30 p.m. Oct. 6 at Hard Rock Stadium.